From 18 to 27 Jan 2019, tell us the Disney character you love best and you could win a pair of Category 1 tickets to Disney On Ice presents Mickey’s Super Celebration. The lovable Mickey Mouse is back in Singapore! Participants of this contest must be aged 18 and above. This contest ends on 27 Jan (23.59pm) and 5 winners will be announced on 1 Feb 2019. This Contest is open to all Singaporeans and permanent residents of Singapore, currently residing in Singapore, over 18 years of age, except employees of Frasers Property Management Services Pte Ltd, its advertising agencies, retail tenants of Frasers Property Singapore, their immediate families or anyone else connected with this promotion. No third-party entries, bulk entries or entries submitted by agents will be accepted. 1. 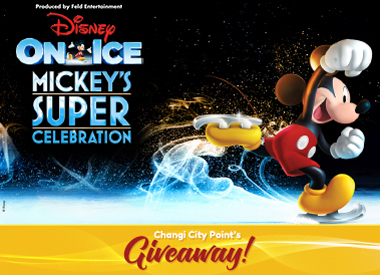 The contest is “Disney On Ice Giveaway with Changi City Point” and the “contest period” is from 18 to 27 Jan 2019 (23:59pm). Winners will be announced on 1 Feb 2019. Five (5) winners will each receive a pair of CAT 1 tickets to Disney On Ice presents Mickey’s Super Celebration. Participants must be over 18 years of age at the start of the contest period, must have a valid Instagram account (for verification purposes) and must be a follower of the Changi City Point’s Instagram. Participants whose Instagram accounts are not open to public will be disqualified. FPS reserves the right to disqualify any entry submitted by a participant with a fictitious or phantom Instagram profile. One (1) entry by a participant must consist of the participant’s favourite Disney character and a tag of their friends in the comment. Each entry has to be submitted by leaving a comment in the comments section of the contest post. A maximum of one (1) entry per person is allowed for the Instagram contest. When a participant submits two (2) or more entries, the last submission will be accepted and the rest of the entries will be void. 5. At the end of the contest period, all eligible entries will be compiled. Changi City Point will select five (5) winners from Instagram. The winner will be announced on 1 Feb 2019, via a winners’ announcement post on Instagram. 7. All winners will be determined by Management of FPS (whose decision shall be final) on 28 Jan 2019 after the closing of the entry period and notified on 1 Feb 2019 via a tagged comment in the same Instagram post and a winners’ announcement on Changi City Point’s Instagram Page. 8. All winners to this Contest must contact Changi City Point via Instagram Direct Message within 7 days of the announcement of the winners. Selected winners must provide the first and last two characters of their NRIC (eg. S9xxxxx8K), Full Name as per NRIC and E-mail Address for verification purposes to determine their eligibility for the prize.